Winter. White, quiet and awaiting your adventures. The canvas of snow that the winter lays down provides both a painter and a sculptor’s delight, with the only limiting factor being your imagination. 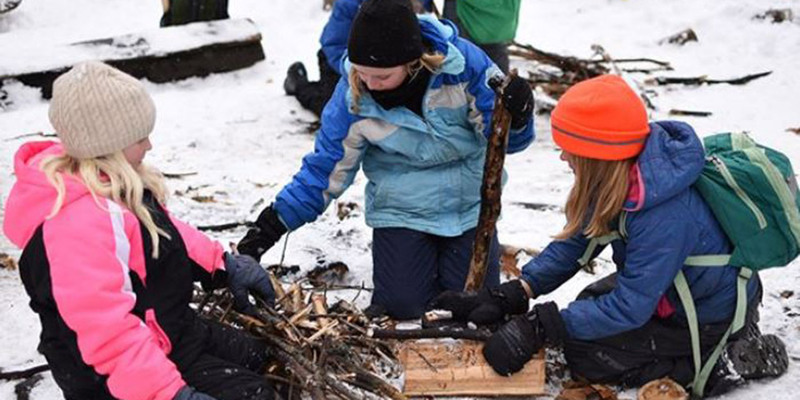 It’s easy to overlook the amount of great activities that winter can provide for us—both for learning and for fun, but with these 10 winter activities for Scouting, you’ll have plenty of new things to try with your Section. There is nothing quite like stepping into the cold crunch of a fresh snow pack. Help Beavers experience an appreciation of nature for years to come by introducing them to winter’s peaceful landscapes. Animal tracks are evident throughout the forest in the winter—thanks to the snow. Allow youth to fully appreciate the animals they are sharing the day with, even if they are hidden far away in the forest. Play games. Beavers can take a break in their walk every 15 minutes or so to enjoy scavenger hunts, which will keep youth engaged throughout the walk. Leave No Trace. Put conservation into play by ending your scavenger hunt with, “Find something that doesn’t belong”, to encourage environmental stewardship on the trail. One of snow and water’s best attributes is that it can easily be molded in to all kinds of shapes and objects. Youth can create a bowling alley out of the snow pack, including everything they can dream up. It may start out with the lanes and benches, and end with a palace that they all have rooms in. Fun tip: Natural colouring spray for the snow will enhance their designs. Bowling balls. Fill up balloons with water and let them freeze overnight, then simply remove the balloons and voila! Sizes can be made to vary so that youth and adult Scouters can enjoy. Youth can take on the great challenge of an extreme lifestyle on a scale that fits their strengths. 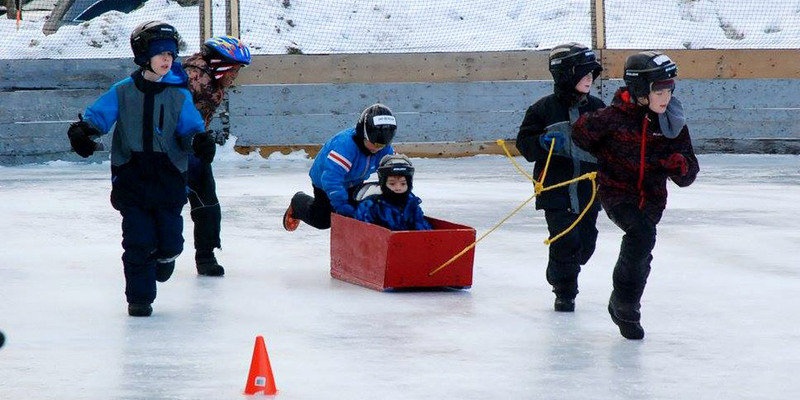 Split youth into teams, each with a sled—this can be made of wood if available, or cardboard boxes with string that the youth can decorate according to the theme of their team. Youth then travel from “town” to “town” participating in various activities, taking turns pulling the sled that holds all their gear and lunch. Crossing ‘raging rivers’ on a limited amount of rocks (the popular challenge using ice-cream pale lids on the snow). Pulling the sled through a timed course. Searching for ‘gold’. A blindfolded youth retrieves objects from a course, guided by their teammates. Team work. Team ski-walking, tug of war or moving a heavy object as a team (such as a tire or log). Mores Code. Send a secret message across a field. Build a ‘town’ out of snow to eat lunch in. Have the youth split up into ‘hunters’ and ‘animals’. First, the Animals will wear cardboard footprints strapped onto the bottom of their feet. Next, set boundaries in the forest. Giving the Animals a head-start, the Hunters will then follow the footprints of the Animals to try and catch them all. Once all the Animals are tagged or captured, the youth can switch roles. Enhance your next hike with geocaching—a rewarding activity that uses a GPS to find capsules left behind by other individuals. Each cache is coded with hints and fun riddles. The caches can include a variety of rewards and knickknacks. Knickknacks can be swapped out for an item you have on you such as badges, pins, etc. Take your adventure to the next level on snowshoes or cross-country skis. You can even create challenges between Patrols in your Troop or other Groups by having a race, in which Patrols must find the most caches in an allotted amount of time. Simply find an area with several geocaches already in place or create a handful of your own! Bring STEM into your fun activity by placing a large amount of snow in a porous material (such as burlap). Challenge youth to melt an allotted amount of snow from the bag (in a volume-measuring device) by creating a fire. Fun tip: Enhance the challenge by providing as much, or as little fire materials as you see fit. 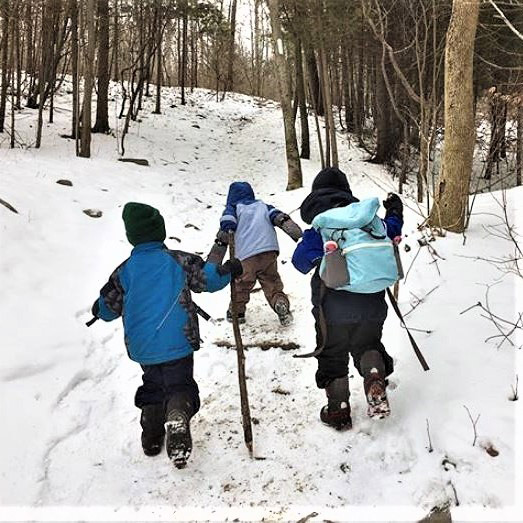 As the snow begins to melt, the youth will gain a greater understanding of the principles of density and awareness of snow’s properties. Youth will also develop fire-making skills for winter conditions. Looking for a fun full weekend activity that gives youth a collective challenge to overcome? First, youth must create very large pile of snow and let it sit for at least 12 hours to harden. On the next day, youth will dig out enough space for them to sleep in the quinzhee (2-3 people per quinzhee is best). Safety note: Youth must sleep with their heads near the entrance in case of a collapse. For safety and warmth, do not hollow out the quinzhee too much. This is still one of my favourite activities I have encountered throughout my Scouting years. The challenge is to engineer a device that can safely be moved—while burning a fire and boiling water. Youth are provided with twine and other materials as seen fit (i.e. flint, matches, lighters). A tin can filled with water is also provided to be boiled. Once the youth have constructed their contraptions, they must then walk a course with it. At the end of the course, the water temperature is measured to determine which team was the closest to a boiling temperature if there is no evidence of a rolling boil. 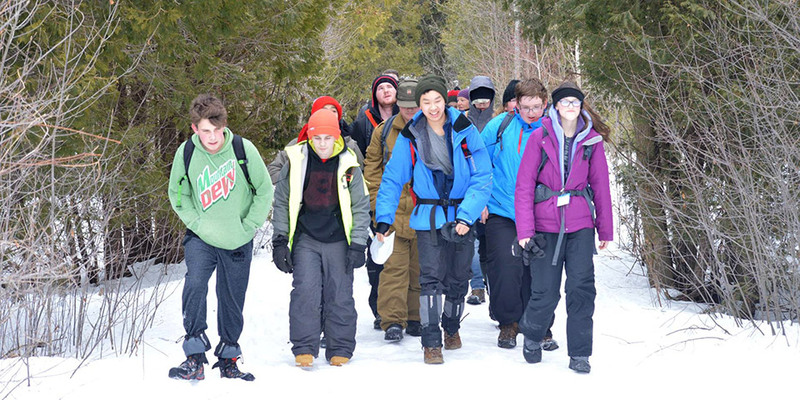 If you enjoy backpacking in the summer, why not challenge yourself and test it out in the winter? Take quieter trails with less packed snow for an extra snowshoeing challenge. Remember to practice safe winter camping by planning ahead, letting someone know where you are going, checking the weather forecast and if applicable, the wildlife or avalanche warnings in your area. 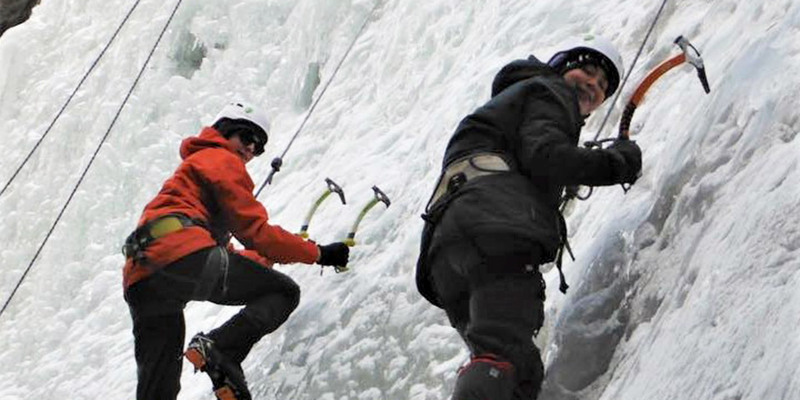 Ice climbing is an exhilarating activity that you can adapt from summer rock climbing. This activity allows you to climb various terrains, practicing your skills in a new and challenging settings. Alternative Adventure: If heights aren’t for you, you can also go canyoning—walking through canyons on ice picks—along frozen rivers. Before embarking on these adventures, make sure it is sufficiently cold enough for thoroughly frozen ice. If it’s your first time, consult someone or an organization with expertise in the area who can help you enjoy a safe adventure. Plan ahead for all activities. Make sure someone knows what your plans are and where you will be. Shorter daylight in the winter means starting your activities early in the day. Ensure that everyone in the group packs a flashlight and extra supplies on the off-chance that nightfall catches you off guard. Tip: You have 15 minutes before sunset for every stacked thumb you can make from the horizon to the sun in the sky (calibrated to latitude ~43, research online what this time means for your latitude). Bundle up in layers and avoiding sweating, which will make you colder when your body cools. Many of these winter activities can be flexible to meet the skill level and experience of your Section. Tracking animals in the snow, having an ice-bowling party, sleeping in quinzhees and melting snow are challenges that can be molded to fit each Section’s needs.